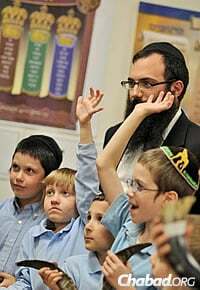 Cheder Chabad of Baltimore now occupies a former synagogue that was donated to the school. It’s not often that someone receives a 55,000-square-foot building as a gift. But that’s exactly what happened to Chabad of Park Heights and its school, Cheder Chabad of Baltimore. 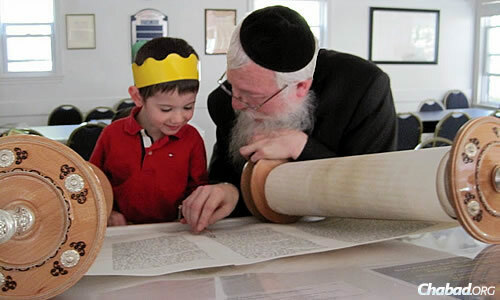 “We are in the process of inaugurating the building this year as the official cheder,” teaching the basics of Jewish education and the Hebrew language to young children, says Rabbi Elchonon Lisbon, director of Chabad of Park Heights in Baltimore. 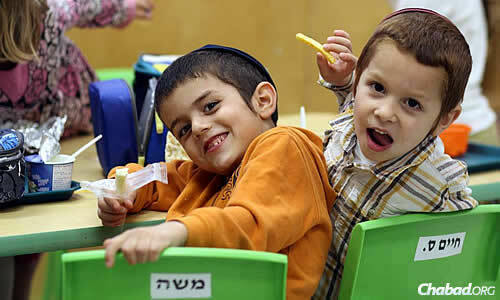 Eight years ago, the school was just the brainchild of a handful of parents in the community who wanted to bring a Chabad chinuch (education) to their children, explains Lisbon. It started with 10 preschoolers in the basement of one of the parents’ homes. 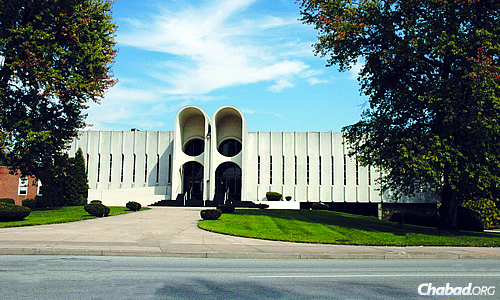 The school originally catered to the children of Chabad rabbis who lived in the area and Chabad Chassidic families that had moved to Baltimore. “The area is affordable, and there’s a lot of Yiddishkeit,” he says, noting the city’s significant and long-standing Orthodox community. That was the nucleus, he says. But today, he notes, there is a mix of children: both Chabad and non-Chabad. The school now offers five grades for boys and two grades for girls, plus preschool, for a total of about 170 children. 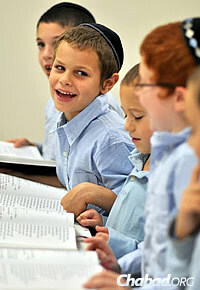 Then it moved to a small house adjacent to the shul, and the school grew from 12 to 40 children. “It was no small feat, but we did it,” says Lisbon, who credits preschool director Chanie Feldman with her tireless work and involvement along the way. 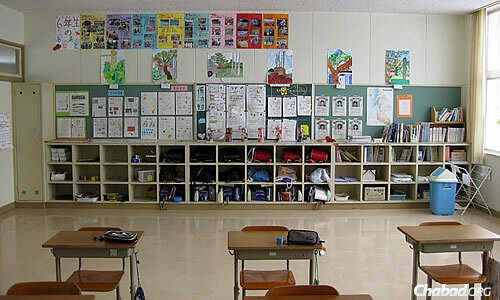 After a few more years, the school again outgrew its space. At that point, administrators didn’t know what to do next. There was nothing readily available, says the rabbi, until he got a phone call from someone not affiliated with Chabad, telling him about a synagogue in the community that wasn’t being used anymore, and which could be an option for Chabad and its school. The owner, Dr. Paul Volosov, was apparently looking to do something positive with the building. Rabbi Elchonon and Tziporah Lisbon oversee the school, teach classes at their Chabad House and provide outreach to the community. “So I called him up, and he invited me to take a look,” says Lisbon. Then one morning about a year ago, Volosov called, telling the rabbi that he wanted to donate the building to them. Sheiny Rivkin, co-director of Chabad-Lubavitch of Towson, Md., with her husband, Rabbi Mendy Rivkin, have three of their four children—the oldest is 7—enrolled at the school, which is about six miles away. This is their fifth year there. 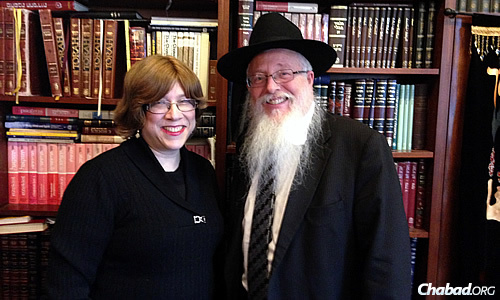 Rabbi Elchanon and Tziporah Lisbon, both originally from Massachusetts, have led the Park Heights Chabad House since 1982, running services and holiday programs, teaching Rohr Jewish Learning Institute (JLI) classes, providing outreach and overseeing “Anash”—its core group of local Chassidim. The school now offers five grades for boys and two grades for girls, plus preschool, for a total of about 170 children. But it’s the school, they say, that has really revved up their work and access to the local Jewish community: “It has given us a presence and availability that have really expanded our reach,” says Lisbon. Lisbon works one-on-one with a student as part of a curriculum that emphasizes the basics of Jewish education and the Hebrew language. The owner renovated part of the building with upgraded classrooms before giving it to the school. attended and taught in the building shown when it was a Reform Temple 2-0-30 years ago, now attending Chabads in the Chicago suburbs What an inspiring article. By coincidence, I am 73, go to Chabads-in Niles, Illinois, and one in both just remodeled, with a large Russion membership.